Adding ooey, gooey, sweet and sticky caramel to a crisp fall apple is always a good idea. And adding coconut and chocolate on top of that? Brilliant. Cover large plate with parchment; spray with cooking spray. Dip apples, 1 at a time, into caramel sauce, turning to evenly coat each apple. Hold dipped apple over bowl to let excess caramel drip back into bowl. Dip apples in coconut; place on prepared plate. Refrigerate 15 min. Microwave chocolate in separate microwaveable bowl 1 to 1 min. 15 sec. or until chocolate is almost melted, stirring after 1 min. ; stir until completely melted. Drizzle chocolate over apples; return to plate. 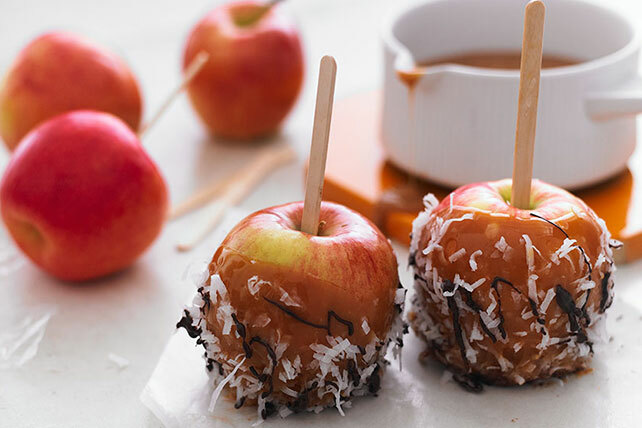 Here's a special-occasion treat that is perfect for enjoying in the fall when apples are at their peak. Substitute 2/3 cup chopped PLANTERS Salted Peanuts for the toasted coconut. Look for wooden pop sticks in craft stores. Or, you can use lollipop sticks instead which can also be found in most craft stores. If the apples you purchase are waxed, be sure to wash the wax off completely before dipping apples in the melted caramels.